I am a direct stone carver, which means, when beginning a new sculpture; I normally do not have a preconceived idea of what the final form will be. Instead, the unique characteristics of each stone, its natural contours, color, veining and the way it breaks when chiseled, as well as my aesthetic sense determine the final form. 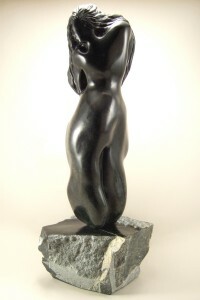 Many of my sculptures depict my reverence for nature, and my admiration for women. The final sculpture represents a collaboration between the stone and sculptor, which brings an element of truth to the work. This element of truth is an important part of my art, because truth communicates the possibility of understanding more than just the artwork.